In January, I surprised my best friend with a trip to beautiful Hilo, where we indulged in the best strawberry and grape mochi at Two Ladies Kitchen, walked through a colorful farmer’s market and hiked along a dead volcano. 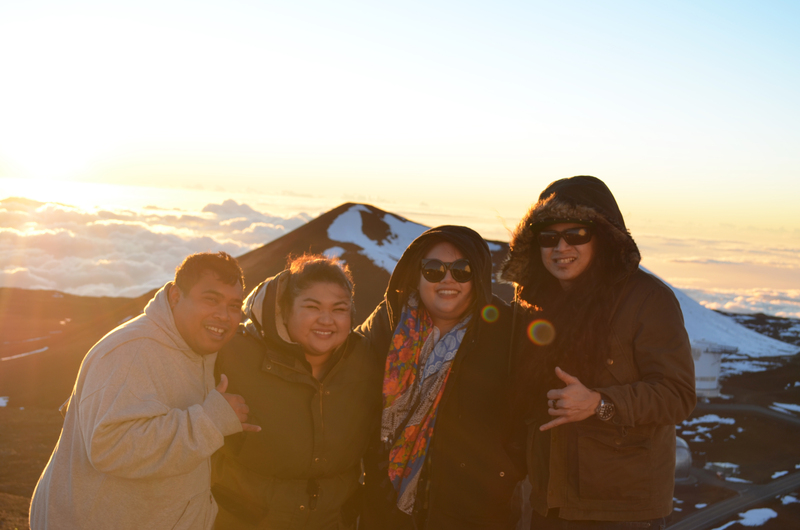 One of the highlights was going on a private tour of Mauna Kea, commercially known as the tallest mountain on earth, culturally known as a sacred place where the Hawaiian deity Poli’ahu dwells. It is a place where Ali’i would trek its harsh, freezing temperatures to worship and pay tribute to their gods. It was an unreal experience to have with my friends and it was just a perfect moment in my life. I could explain to you the controversy that surrounds Mauna Kea at this moment, but instead, I will share some of the things that I believe should be kept sacred, just like this mysterious and beautiful mountain that made it into my “epic memories” folder. 1. Indigenous places of worship and untouched lands. We need to eat vegetables, wear sunblock and do yoga. I may not look like it, but I eat my recommended daily amount of veggies (sometimes more), wear at least SPF 35 on my face and forearms and do yoga a few times every week. Doing this makes me feel great and happy. 3. Your relationship with your God. This is a touchy one. I’d describe myself as a sporadic non-practicing Catholic who floats between Catholic and Christian churches. Going to a Catholic church makes me feel comforted and grounded. I feel like I return to who I am and who I imagine myself to be when I get older. But damn, have you heard the kind of music they play at Christian churches nowadays? I mean, they make worship feel and sound fun. I go for the live jam sesh, devos and free food, but when it comes to openly sharing my own struggles with the entire congregation and praying out loud…like with my voice…I start to get uncomfortable. Other than that…I pray every day. I ask my God to give me patience to tolerate the obnoxious, love for those who can’t help themselves, determination to extend my leg in half moon pose and gratitude for everything I have. Whoever your God is, rely on him or her to give you that spiritual boost to continue life in a positive way. It’s better than bitching all day. Bitching makes you look ugly. Don’t do it often. Be tight with your God and moisturize daily. Being a nerd, I am always on top of the latest technology. Although I love iPads and my boyfriend, the iPhone 6 Plus, I still read paperbacks…maybe a hardcover or two if they’re on sale. I own a Nook, but lost the charger. So it’s pretty fair to say that paperbacks (and hardcovers) should remain sacred because they won’t need to be recharged, updated or bought for more than $15. My Nook is now a coaster on the nightstand. Passion drives you to do your best in everything you do. Working in the non-profit sector doesn’t make me rich, but it keeps me fulfilled in life. I see lives changed and problems solved. My body and mind may be weary but my soul and heart are so full. My best work was inspired by what I’ve seen and experienced by giving to others. Also, being in a creative field, if I am not passionate about something, it takes me longer to create it, which makes the client or your director impatient. That’s when you have to delve further into the purpose of what you create or produce. For example, I had to create a graphics package for National Donut Day. I did not have the slightest interest in donuts (first of all, they’re not my fave, second, I didn’t get why it was declared National Donut Day). My director recommended that I read a book to draw some inspiration. After that, I got it. I knew exactly what to do for the graphics package and it became a hit. Passion gets you places. It also shows you how to succeed. There are probably more things that I could add to this list, but there’s no time. Sometimes it is best to keep a short list of things you consider sacred. It helps to remind yourself about where you come from and who you are. Mi prima graduates with her Master’s Degree!